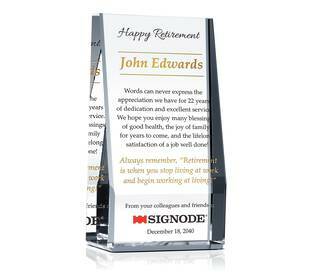 Crystal plaques are popular as retirement awards because they offer special recognition to retirees. 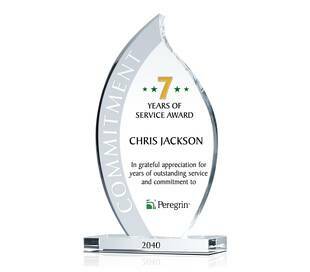 Optical crystal is popular to make retirement awards for its clear perfecting and sparkling reflection. Retirement represents a turning point in the lives of most people. It provides a time to reflect on one's past work/professional accomplishments and to look forward to a more relaxed, carefree and enjoyable lifestyle. Virtually all people feel that such an important day deserves special recognition, and many choose to present a crystal plaque/award to retiring people from all walks of life. Why choose crystal plaque as unique retirement gift? Face it, are plastic and metal trophies or wooden plaques really what you want decorating your house? Well, neither do your clients and employees. Crystal awards have that wonderful factor that attracts attention and says “You’re special”. 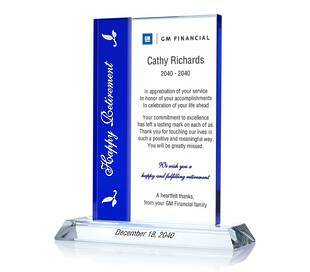 Crystal plaques are popular as retirement awards ideas because they offer special recognition and retirement wishes to retirees. They're attractive and easy to display. Recipients are proud to hang a distinguished looking plaque in their home. Such high visibility often makes presenters willing to spend more on this type of award. Because they represent years of service, as well as commemorating a once-in-a-lifetime event, people are inclined to choose quality materials like crystal for these plaques. Now crystal item may be your best retirement gift. Retirees come from all walks of life, from business executives to pastors to teachers. It's important to recognize the individuality of the recipient. A retirement plaque for a soldier may be very different from one for a pastor; a retirement gift for man may be not suitable for women. As diverse as retirees may be, those wishing to honor a person's retirement are at least as diverse. Employers who wish to honor a retiring employee can be as small as family-owned cafe or as large as General Motors. But our pastors, teachers and military members may have different tastes and interests. There are many other people in a retiree's life, who also may wish to commemorate such an important day. How to show the significance and important on the retirement plaque? The retirement wording including retirement poems, quotes, wishes on the crystal plaque is always play vital role. Each retirement plaque wording should reflect the personality of both the presenter and the recipient, as well as the relationship between the two, sincere retirement wishes, love or appreciation. A plaque awarded to a retiring teacher from her students would probably be much different than one presented by AT & T to a retiring engineer. Retirement is an important occasion for most people and a well-designed, well-thought-out plaque can help them remember their special day for the rest of their lives, that's to say your thoughtful retirement gifts ideas will help retirees have happy retirement life. So why don't customize the unique crystal retirement plaque at diyawards.com and design the type and layout according to your retirees' tastes and interests. The unique sailboat design symbolizes the beginning of a new chapter of the retiree's life. 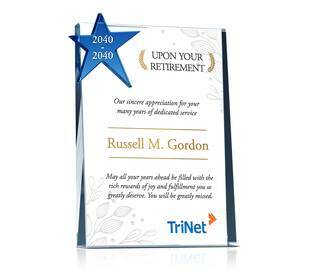 The retirement award offers a great way to say "Good Luck and Best Wishes"
The Star Retirement Plaque highlights outstanding contributions and gives congratulations to the retiree. The etched flowers give this retirement plaque a nice touch. With etched flowers in the background and a crystal star decorating the top, the Star Retirement Plaque is an excellent choice for retirement gifts.